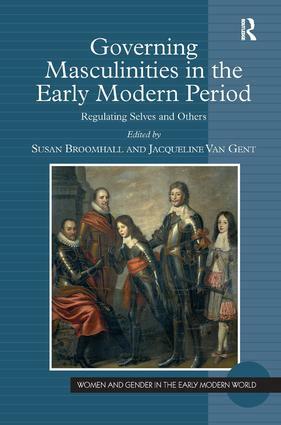 Documenting lived experiences of men in charge of others, this collection creates a social and cultural history of early modern governing masculinities. It examines the tensions between normative discourses and lived experiences and their manifestations in a range of different sources; and explores the insecurities, anxieties and instability of masculine governance and the ways in which these were expressed (or controlled) in emotional states, language or performance. Focussing on moments of exercising power, the collection seeks to understand the methods, strategies, discourses or resources that men were able (or not) to employ in order to have this power. In order to elucidate the mechanisms of male governance the essays explore the following questions: how was male governance demonstrated and enacted through men's (and women's) bodies? What roles did women play in sustaining, supporting or undermining governing masculinities? And what are the relationship of specific spaces such as household or urban environments to notions and practice of governance? Finally, the collection emphasises the power of sources to articulate the ideas of governance held by particular social groups and to obscure those of others. Through a rich and wide range of case studies, the collection explores what distinctions can be seen in ideas of authoritative masculine behaviour across Protestant and Catholic cultures, British and Continental models, from the late medieval to the end of the eighteenth century, and between urban and national expressions of authority. Susan Broomhall is Professor of Early Modern History at The University of Western Australia. Jacqueline Van Gent is Senior Lecturer in Gender Studies at The University of Western Australia.